This easy-to-install kit is packaged as a set of four (4) pieces. They're PRECUT and ready to install in a wide variety of colors - NO TRIMMING required! This stripe package is not just a set of straight 15" (38.10cm) strips in a box. Our graphic kit consists of prefitted and contoured pieces as shown in the illustration. 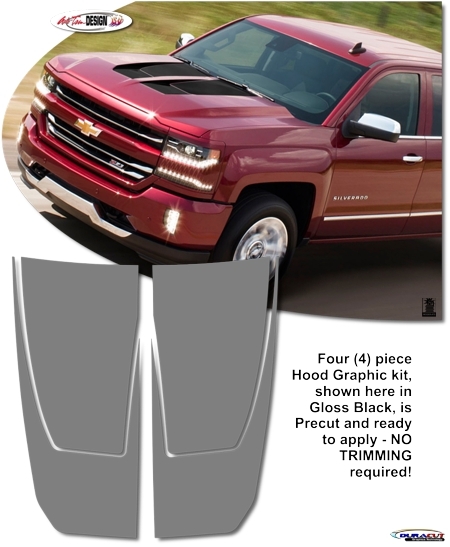 Hood stripe pieces are designed for application on the Silverado's distinct upper flat areas. Includes easy-to-follow general online instructions.